She can feel sorry for herself.Or she can listen...to the voice in her head.For Indigo Phillips, life has always been about basking in the shadow of her identical twin, Violet--the perfectly dressed, gentle, popular sister. The only problem the girls had in their lives was the occasional chaos that came with being part of the Phillips family brood. But when Violet becomes terminally ill and plans to die on her own terms via medically assisted death, Indigo spirals into desperation in her efforts to cope. That's when she begins to hear a mysterious voice--a voice claiming to be God. 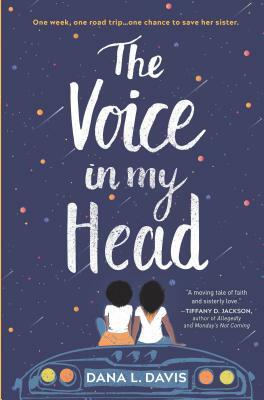 The Voice insists that if she takes Violet to a remote rock formation in the Arizona desert, her sister will live.Incredibly, Violet agrees to go--if their dysfunctional family tags along for the ride. With all nine members stuffed into a wonky old paratransit bus, including their controlling older sister and distant mother, Indigo must find a way to face insecurities she's spent a lifetime masking and step up to lead the trip. As she deals with outrageous mishaps, strange lodgings and even stranger folks along the way, Indigo will figure out how to come to terms with her sister, her family...and the voice in her head.